Here, we introduce the fundamentals of project management. We present definitions of the most important terms and lay out the project life cycle. From this and from observing real project life, we draw some basic consequences that form a general project management principle. Budget: the budget for creating those deliverables and services is limited. In sub-section "What Is a Project? ", we go a little bit deeper into details of this definition and give an example. 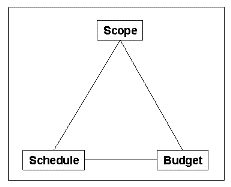 We call the combination of scope, schedule and budget the triple constraint of project management because we cannot change one of the three cornerstones without changing the other two. Definition of project management: Project management is the management of the triple constraint to the satisfaction of the stakeholders of the project. 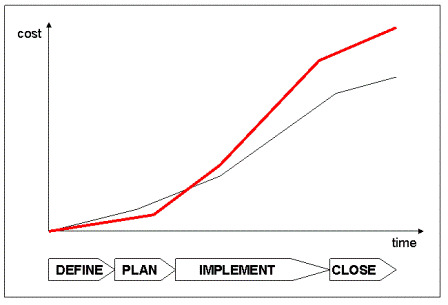 We consider project management being a process which we describe more detailed in PM Process. Let's take an example, a typical construction project. We have a customer who wants to create a certain building and a supplier who will construct that building. Now, we can list the natural flow of major project activities as follows, divided into customer activities and supplier activities. This we call the project life cycle or project management life cycle. By including the major milestones for both parties, and following the view of the customer, we recognize the four project life cycle phases. For the most important aspects of other project life cycle views, please refer to sub-sections Project Management Models and Managing IT Projects. Under ideal conditions we would expect the real accumulated project cost being virtually the same as planned in definition and planning phase. In an ideal world, we would be able to implement the project plan without changes or additional work being necessary. But the reality of project implementation is different in our world. We are not able to plan for each and every eventuality, sometimes things go wrong we never could think of, let alone plan for. Additionally, our resources for project planning are usually limited, so that we more or less consciously remain a little rough and vague with parts of our project plan until signing any contract. We tend to spend less in definition and planning phase but have to pay a multiple of those savings in implementation and closure phase, and thus cannot stay within the planned schedule and budget. What are the reasons for this phenomenon? 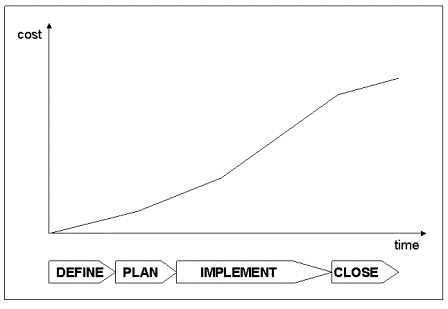 Poor planning results because those who do the planning (usually the sales team) are not experienced in managing project implementation and closure. Insufficient handover from sales team to implementation team, and insufficient support by experienced project managers towards the sales team. Emphasis during project definition and planning phase is put more on customer relationship management and negotiating the contract on a more general level. There seems to be a lack of risk management and a lack of contract management in early project stages. Lack of stakeholder management throughout the project life cycle. Project goals are not clear and change too often. Poor soft skills in project teams. If you are looking for a complete description of the core project planning process, we offer you our e-book, Project Planning Guide, in PDF-format. It covers the 10 steps of planning and contains an example (a photo-voltaic solar plant) to illustrate the application of the explained principles. On this web site we propose kind of a master plan that helps to minimize extra work and additional cost in implementation and closure phase, and thus, to improve your project results. 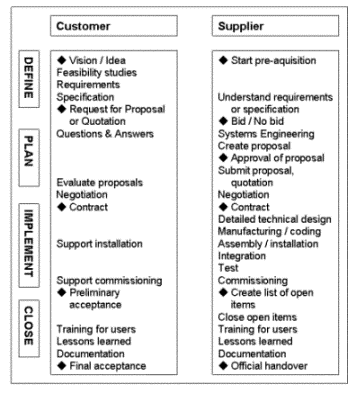 In sub-section Project Management Basics, we present pre-requisites for this whole web site.